My wedding is perfect. That's the only word that I can find to describe it. Now, that sounds a little obnoxious, no? NO! It doesn't because it is the perfect-est wedding I know (no one can argue with the bride about how great her big day was, right?) I have been waiting for this day for years. Yes. 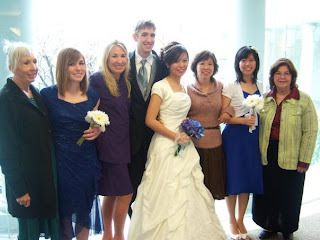 Ever since I was 19, I wanted to get married. My wish has come true. So, yay for me. There are a few reasons why I would always look back on the day and say, "Man, that was one perfect wedding." You see, we had the perfect place for our wedding--the temple. No where else on earth can beat that. It was beautiful from its exterior, its purpose was to perform sacred ordinances (marriage for TIME AND ALL ETERNITY--totally beats the 'til death do us part' thing), and ultimately, it is the house of the Lord. Everytime I thought about the moment when I was married to Leighton in the temple, I felt like bursting--with joy, of course. 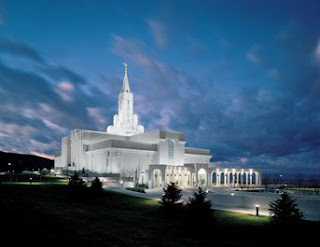 How I came about choosing the Bountiful temple out of all the other beautiful temples in the Utah? Well, at first I wanted to get married in the Salt Lake temple, but I know that we might have to wait for six months til the temple is available (since so many people get married in that temple). Then I thought, maybe St. George temple because I love it too. But I wanted to get married somewhere colder. So one day, I remembered the Bountiful temple. I recalled how I felt when I first saw it. It was so white, so beautiful in the snow. It was on the hill as well. Then I know that would be the temple for me. It turned out to be the PERFECT temple for me. Then, there's the perfect weather. I guess to a lot of people freezing cold and snowing would not be considered fun, let alone perfect. But it was to me. I would not get married in any other weather. 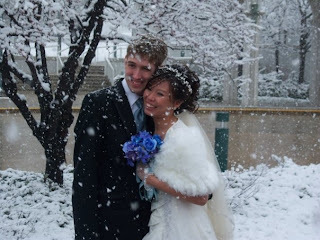 I dreamed of a cold and snowy day for my wedding ever since I was little. This is what I wanted for so long. I was in the hair salon when it snowed. I looked out and saw snow and thought it was just the white flowers from the trees being blown by the wind. But when I realized it was snow, I couldn't wait to go out and see it fall. 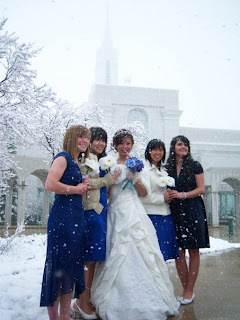 When we were taking photos at the temple ground, in the snow, I didn't feel cold at all. I enjoyed the snow. I loved it. I love how it fall so softly on my hair, my nose, my eyelashes and my dress. I couldn't ask for a more PERFECT weather. It must have been cold. But I was too stoked to notice. I am very fortunate to have a group of PERFECT bridesmaids. They are all SOOOOOOO beautiful. They were there to help me with my train, and make sure I stayed pretty despite the wetness. 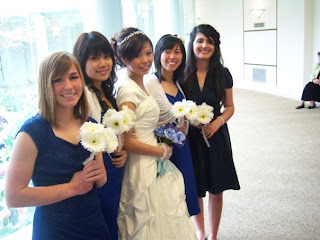 They also tried hard to find the dresses that match the color I want--royal blue. They are so gorgeous in blue. Most importantly, they are my best-est friends and sisters. We had the PERFECT guests too. They were friends and family members we haven't seen for ages. It was soooooooooooooooo nice to see them all again. 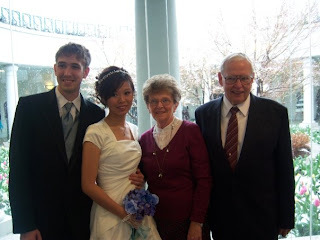 It meant so much to me that they would drive for hours or fly for hours just to go to our wedding. It also meant so much to me for their presence. 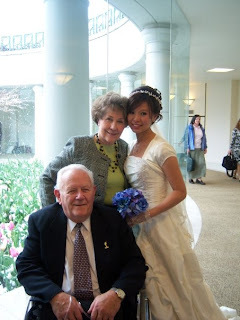 I felt like I was in heaven when I saw all of my dear, dear friends in the temple, waiting for me patiently. Each hug and kiss meant the world to me. Thank you all!!! You guys are one of the PERFECT pieces in my wedding day puzzles. The Watts! Oh my...it was like the greatest moment to see their healthy faces. Oh..how can I forget my PERFECT MAN? Without him, I would never have my PERFECT wedding. Without him, I would never have a complete life. You're the man, Leighton. You're my PERFECT companion. I couldn't ask for a better partner for life. I ai You! We are lawfully and legally married forever now, YAY!!!! I got to take pictures at the Salt Lake temple anyhow. With my man, of course. Your wedding was so beautiful!!!! I'm so sad I missed it and couldn't be there to be a bridesmaid!! Just curious. 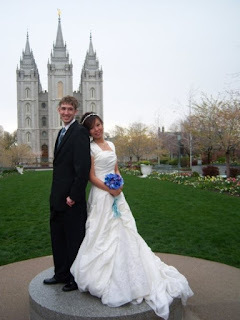 Did you pick the temple marriage day to coincide with Sister Jensen's birthday?